Working with students at Western University’s Certificate in Digital Communication program, I gathered data* on some of Toronto’s theatres. We ranked them by Klout score. Klout has its critics, but its business is growing. Did you know that people with Klout scores over 40 get access to Cathay Pacific’s first-class airport lounges? According to Business Week, the airline covets customers with social media authority. How long before theatres offer premium “Tweet Seats” to patrons with high ranking Klout scores? If, as Klout claims, a high score is a measure of influence it might be beneficial to get those folks tweeting on opening night. 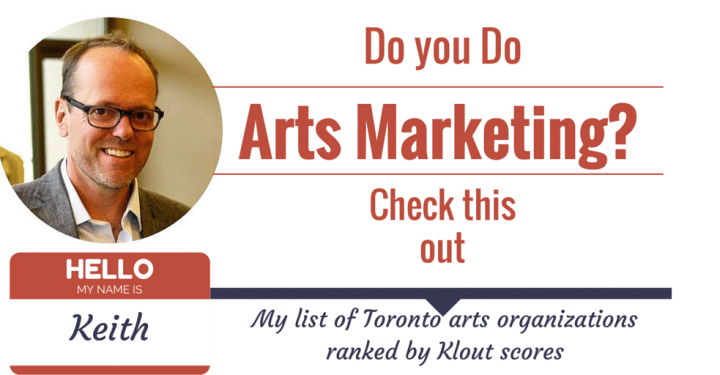 We didn’t include the Stratford Festival (tied for 1st place with a Klout Score of 63) or The Shaw Festival (Klout score 52) on this list. More about them next Monday. *The data was gathered the week of Feb. 11, 2013. Since then World Stage has jumped to the top with a Klout score of 65. Are Broadway Grosses Down Due to Discounts?